Summary: The “yellow vests” movement in France has the classic form of a peasants’ protest. It has the usual causes – and a uniquely modern twist that almost guarantees its failure. Just like the Occupy and Tea Party movements in America. — Slogan of the Yellow Vest movement. “Liberty Leading the People” by Eugène Delacroix, commemorating the July Revolution of 1830. The “Yellow Vests” protests are spreading across France, but the news coverage is paper thin about what is happening. The protests began on November 17th, when hundreds of thousands of people across France turned out to protest fuel taxes that Macron imposed as part of a plan to reduce energy consumption and tackle climate change. The news media report the facts without understanding. Bloomberg describes the events with their usual incisive reporting: “France’s Dangerous Yellow Vest Protesters” by Gregory Viscusi. It is well worth reading in full. “The ‘Yellow Vests’ – ‘gilets jaunes’ in French – reflect France’s frustration at a young leader whose agenda is perceived as favoring the rich and whose manner is regarded as aloof and arrogant. ‘The gilets jaunes movement will probably peter out, but not the anger, which is likely to go on and take new forms maybe more dangerous for Macron,’ said Jim Shields, a professor of French politics at Warwick University in the U.K. “It’s hard to see how he can complete controversial reforms like pensions and unemployment insurance without yet more blood on the pavement. The NY Times gives its usual good reporting (well worth reading), slipping in what the French security services tells them. The BBC adds an important factoid, contrary to the NYT. This reminds us that this could easily happen in America. Macron leads a “national government” of the establishment’s left and right wings. Much like Merkel’s coalition which has ruled Germany for over a decade. The protests were sparked by opposition to specific policies, but quickly expanded into broad opposition to their rulers – as people realized that France’s elites govern in their own interests – not France’s. But the only alternative choices offered the public were the bonkers far-Left and far-Right parties. So the opposition burst outside the political system into violent protests, as has happened so often in France (e.g., 1848, Spring 1871, and May 1968). These could spread from France across Europe, as has happened before. Other groups are also rioting these days in France: see this about the frequent riots by migrants. The key thing to know about peasants’ protests: they can destroy – sometimes on a large scale – but almost always fail to accomplish much (see a list). An exception are protests allied with, or pawns of, powerful special interests. That was true in the Great Rebellion of 1381 in England, in the peasant revolts of Edo period in Japan (1603 – 1868), and in modern China. The figureheads in the government might change (Macron was toast anyway, due to the public’s dislike and absence of any supporting party structure). Minor concessions will be made (small retreats in elite’s policies, delay of their programs). Many contrite words will be said. Protestors vent their frustration, getting their moments of attention. Afterwards they feel better and go home. Peasants’ protests fail because they are peasants. Organization, planning, rational goals, internal discipline – all these are foreign to peasants’ nature. But modern protest movements put a special twist on their protests: no formal leadership. The Arab Spring revolts, the Tea Party, the Occupy Movement – all went to glorious failure flying the “no leaders” flag (details here). This more than offsets the advantages that modern communication tech gives protests. The great peasant rebellions of the past had little or no more or ideological justification for opposition to their rulers. All their moral systems justified unlimited rule by their elites. So they can list minor grievances, but not propose meaningful reforms. Also, the lack of large and powerful goals makes it difficult to build group cohesion among the protesters, as they have their own favorite grievances. We have a tradition of collective action through which leaders emerge that citizens can follow. We have a moral and ideological basis for opposition to our ruling elites when they no longer govern in our interest, available should we choose to use it. Neither of those things makes our people into citizens, or guarantees victory of citizens over unjust elites. These just mean that we can try with hope of winning. Occupy Wall Street, another futile peasants’ protest. Lessons from the failure of Occupy Wall Street, its lasting legacy. How do protests like the TP and OWS differ from effective political action? The Million Vet March, a typical peasants’ protest. Does it portend more serious protests in our future? About this new era of protests by the Left. Martin Luther King Jr. warns us about political violence. Fight for the Streets and Fear of Civil War. Nothing is inevitable. We can step off this path before its ugly end. Previous Post Hot fake news about RussiaGate! Read all about it! Thanks for the article and links. I spent most of Saturday watching the riots in real time from an RT live feed. It brought back memories of Vietnam protests here in the States. I’m also surprised at the lack of news coverage, I figure the greens didn’t want their misguided clean air movement related to Paris being trashed after Macron lit the fuse with his carbon tax scheme. I don’t know about his decision to use rubber bullets, percussion grenades, and tear gas against the thugs from the suburbs armed with rocks and spray paint, but it was fun to watch. He may go the way of Marie Antoinette. Looking forward to next Saturday. I think there is a subtle system of control that suggests, not that leaders can be corrupt or foolish (undeniable), but that leaders are intrinsically those things – and which guides people, then, to take great efforts to avoid having leaders. It reminds me, though it is a tangent, with the continental congress here in America, who were so terrified that a standing military would become a dictatorship that they nearly drove the officers of the continental army into — an uprising, because they needed their pay. We often create what we fear most. Children’s’ groups often do not have leaders. There are no reasons, other than that they are children. Larry: Great article. My knowledge of that specific incident comes from one specific and focused history text I read in college… I was lucky enough of course to be in history courses sufficiently advanced to have in depth examinations. Thanks! i think that brexit and M5s (Five Star Movement) in italy can be added to the peasant revolt: no leader (officially in fact they have) no organization, planning, rational goals. 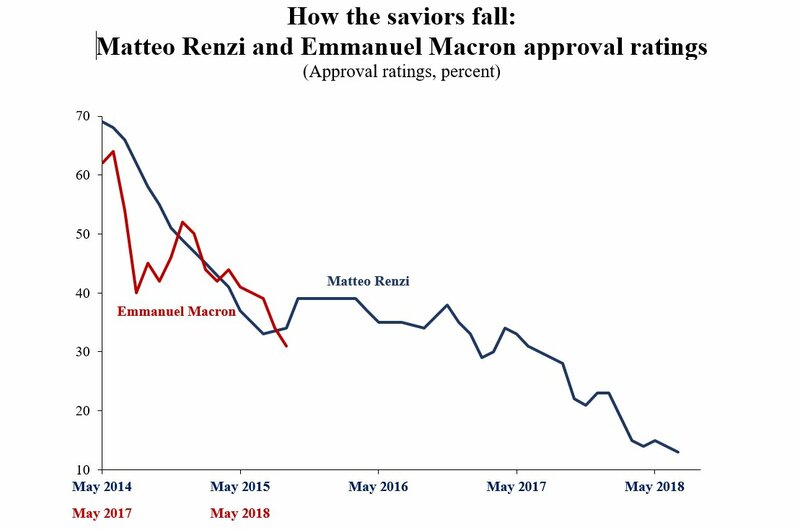 and mr Macron manage to do even worst of mr Renzi that need three years to arrive at 25% approval rating. I disagree. Brexit is a specific policy proposal with broad support at all levels of Britain. It is not violent, has government sponsorship, and is a well-defined policy proposal — all the opposite characteristics of a peasant protest. The Five Star Movement is also the opposite of peasant protest. It is an organization, has structure and leaders. Protests have spread to Belgium and Germany. I’m glad Trump pulled out of the Paris accords. Good post, and I generally agree. However, I’m not so convinced that being leaderless is a disadvantage for the revolters right now. No defined leadership means there are no weak points that the gov’t can co-opt, bribe or destroy. I agree they’ll need leaders at some point…but my hunch is that they’re better off without that for now. I can be convinced otherwise. I agree for the time being, but there is a clock on that, and we are now starting to enter the phase where at least a modicum of structure has to start appearing, not a unified one, but a semblance of a confederate one, even if only based on geography. Political parties and putative representatives of the Gilets Jaunes movement have been convoked to a meeting with the executive for december 14th. it is possible that a sustained disorganization will make it a flop, but a continued mess can also erode public support (or at least a significant part of it) and participation to a point that will make going on as usual a practical option for Macron, even if the next election cycles will be painful for him (the European elections are next year). The “at some point” for representatives is coming faster: there is always a moment for these things, and one has to not miss it. That is true for the Gilets Jaunes, but also for Macron. And the latter seems to have opted to miss it, by aiming at encouraging violence (in order to better stigmatize it), a short term solution (if it works) that will bite him in the rear in the end (electorally). The movement has to find a voice and a face (or several), and establish a precise list of complaints. But as a reminder, in 1789, it all started with an appeal to the people, in their not representative intermediary corps, to establish a list of complaints (the “cahiers de doléances”)…. And the rest is really History. Do you have examples from history of successful movements that followed your recommendation? History shows that movements without leaders are far easier to fragment and destroy. The fondness for leaderless movements is more evidence of Western societies regressing from citizenship to peasantry. Our elites believe they are best fit to rule. Don’t automatically assume that they are wrong. That is chartjunk. “Overthrowing a dictator” is meaninglessly vague, since it uses “dictators” in a child-like way (“dictators” are an actual thing, not a synonym for “govts I don’t’ like”). Also, it should be relevant if “overthrow” means replace one unrepresentative government with another – or chaos. Esp a worse one (e.g., see Color Revolutions). The WaPo has this gem: “It’s not clear exactly how many Egyptians protested in the February 2011 uprising that led to President Hosni Mubarak’s downfall, but meeting the 2.9 million threshold doesn’t sound unlikely.” Well that’s certainly worked out well not well for them! Also, how is this relevant to France – which has an elected government? Is overthrowing an elected government a good thing? See Russia 1918 and Egypt 2013. You must be kidding, considering that Guardian article a good thing. It advocates active attempts to overthrow an elected government in the US. If it was by right-wing elements doing so to Obama, would you have cheered? That is when such a leader goes down the movement falls apart. That is not however a winning strategy. That is quite false. Most insurgencies lose leaders. How many top al Qaeda leaders has the US killed? True. And this is why the reasoning is flawed. I assume you meant that is why your reasoning is flawed. Al Qaeda’s leadership was “decapitated” many times. But it always regenerated, as vital organizations have done so since the Ten Thousand fought out of Persia. AQ is one of the greatest insurgency successes in history, perhaps the second best in modern times. From tiny beginnings in a decade it spread across the global. AQ made the top ranks of insurgency success, taking power (against fantastic odds, without State sponsorship) in Iraq and Syria. AQ failed to mature not because of dead leaders – but due to a more fundamental flaw. They could take power, but were incompetent rulers. Quite bonkers. The Taliban is another story of strong leadership continuing despite America’s assassination programs. They are winning in Afghanistan. Why are “decapitation” programs, assassination of leaders, so ineffective? It is often counterproductive because it drives the Darwinian Ratchet. My first two posts predicted this: in September 2003 and In October 2003. Among all my accurate predictions, this is the biggest. I actually meant what I said. That statement was a paraphrase from one of the blogs I read that is prominent in GamerGate commentating on the Yellow Vests. I am not the originator of that statement. I wouldn’t discount this to be the New Path. Individuals as leaders of popular uprisings are vulnerable, while a nameless, rotating “committees” could be the answer. There’s the Achilles’ heel — discontent is not a direction, just a basic motivation. In most of EU, people are not afraid of terms such as socialism, nationalization or public ownership while here, in North America, those are terms (vilified over generations) almost guaranteed to turn many people away from such movements. The scattered protests (FM ~ Peasant Uprising) have very little chance of succeeding in even temporary changes. How many times has this been said – falsely – in history? It was a staple of leftist thinking in the 20th century, with a consistent record of being proven false. I doubt many with experience leading organizations – of any kind – would agree with you. It would make a great Harvard B-school case study in “modeling organizational structure on dreams”. I’ve often written about the bizarre fondness of both Left and Right these days for apocalyptic dreams. Medieval peasants were also fond of them, probably for the same reasons. They were largely encouraged to think the apocalypse was pending by the clergy announcing it whenever possible (probably because the crops were bad, or a kid was masturbating). It is an effective tool to convince people to turn to the shepherd of the flock and to do as he says. Today, wannabee priests are the talking heads of all kinds in the medias, rendered even more alarmist/aggressive/unhinged (“democracy will die tomorrow if you don’t do this or that, vote for X or Y”) by their diminishing audiences and the need to pander and agitate (to excite those chosen hormones linked to confirmation bias and the excitation of outrage) to the targeted and tribalized groups they are limited to nowadays. So, nothing new since the crusades, all things considered. Do you have some examples? There have been eschatological panics in Western history (some consider the Y2K hysteria a variant, by frame bridging). But they are, so far as I can recall, neither created nor directed by priests. They are bottoms-up phenomena. Again, examples? I suspect you are confusing eschatological beliefs about the world’s end times with belief in personal damnation or salvation (heaven, hell). The latter has been a powerful tool of elites to control their people. That’s an important point – if in fact newspapers have become more sensationalist. I’m unconvinced of that, however. Esp. over longer periods of time. Compare today’s news media with that of the 1930s! This is not wrong, but is a gross misunderstanding of history. There is almost nothing new in history because people do not change. Traits and behaviors are omnipresent across time. History is made by changes in magnitudes and mixtures. So saying “NOTHING NEW” – a response seen in the comments here a zillion times — is meaningless. (6) The real question: why do we find predictions of apocalypse so fascinating – even compelling? Perhaps our Christian heritage pre-conditions us to find them plausible. Also, we have a cultural memory of Rome’s collapse. Hence the role in our myths and stories of a greater civilization before us. See the Lord of the Rings films, with people moving thru a land littered with the remains of a far greater civilization of their own (eg. broken works, wrecked statues). But that does not, imo, explain the hold such fantasies have on us today. There probably are those out there who have explained this! If you’ve seen such, please give a pointer in the comments. As for examples, I don’t have that many of them now, right of the cuff, and more of an accumulated knowledge of them, in the context of French history (par for the course), like the great “paniques de l’an mil” (panicks of the year 1000), or the over-exaltation and instrumentation of the viking raids in the IX-Xth centuries. These were bad in certain areas, obviously, but nothing like what the clergy was saying: it was, in essence, a vast effort of spinning the story and grow it to biblical proportions as a social control tool, but more than that, as a political ploy to grab authority for the Church, in the context of the decaying Carolingian Empire. The rule of Louis the Pious (son and heir of Charlemagne) was still relatively solid for a bit, then crumbled: his 3 sons and their constant wars set the tone for more than a century, giving the various raiding groups -Vikings, Hungarians, Saracens- far greater leeway. In such a context, a power grab by the Church (a religious, political and territorial authority, fully enmeshed in the nascent feudalisty) was logical (as the only power center covering many countries, a multinational corporation of sorts), and to some extent useful as a stabilizer amidst too intense dynastic warfare. But its means to do it were first and foremost population related, and the methods were not subtle. Another example that comes to mind is the period of the wars of religion (from the 1560s to the 1590s in France): the role of the Church using that apocalyptic device is all too well documented, and the sermons given at mass all over the kingdom would give a heart attack to a jihadist today (a lot of the stuffs the protestants/Huguenots were saying is quite out there too). I could also mention the bizarre episodes of the 3 so called “popular crusades”, especially the “children’s crusade”; if I remember the books I’ve read correctly (if someone wants a list of French medieval scholars…. No? Pity), the exhortation that surfed on the more or less spontaneous (or “helped spontaneity”) movements launching these terrible and doomed adventures were not of the moderate, realistic kind. I don’t believe any of those are eschatological panics. That is a myth, and was demolished by historians a century ago. See this in the NYT, this at the World History website, and – for a review of the literature – see this at the New England Skeptical Society. Do you have any supporting articles for that? They were pretty awful. You might consider those people’s fears excessive. But those conquered (East England) or raided (most of the coasts of Europe) felt otherwise. In any case, fear of a real threat is not a fear of the end times. I am moderately familiar with this history and don’t recall anything like that. Again, evidence? Ditto. I have seen nothing suggesting any role for fears or belief that these were the end times. b) 2018, Place de l’Etoile, huge gilets jaunes rally. Clash with CRS. Gilets jaunes arrive under the Arc de Triomphe, make a ring around the Unknown Soldier flame, kneel down, sing “La Marseillaise”. c) In not so few cases, the CRS fraternize with the gilets jaunes, take away their helmets, talk. They understand each other, because they are the same people. e) What will happen the next time, when the gilets jaunes movement will come back after its first defeat, having learned a lot of things? Will the French police obey the government? Maybe not, not always. That would be a major asset. f) Gilets jaunes are not peasants, are not salary men. In their majority, they are small entrepreneurs, middle class and lower middle class people. They can give orders and organize themselves. g) This is “le peuple”, the people, just like Victor Hugo and the Romantics described it. Normal people, families, every age. They are traditional people, with a small t; they are patriotic, nationalists in the purest, oldest French way. They are egalitarian, too, but not communists.They are not burdened with ideology. I stake out bold clear scenarios to provoke thought. Based on 15 years doing this, trying many different approaches, experience has proven this is the most successful. The academic approach, “one one hand but on the other hand”, is too complex for most people. There is no point to writing in a way that doesn’t get an audience. Good point. Better to provoke than to bore. If the yellow jackets found a leader, who might that be? I don’t know enough about it to even guess. Not just who, but what kind? People get the leaders they deserve. Great people, great leaders. These peasant protests sometimes signal *opportunity* to leaders, who build organizations that use public unrest and weak/incompetent govt to gain power. Define success; sometimes even signaling is some kind of victory… It could signal someone that Macron is weak and try to unseat him as you said it. The Hungarian uprising in 1956 wasn’t exactly a success but the government watched out that there always was adequate and decent food available – not like in Romania. Also Hungary had the goulash communism, so Russia gave a little more leeway to keep people from getting too upset. Why the contempt for the “peasants”? You sound rather… high-minded – to be charitable. Is it hard for you to communicate with people at the service counter? Do you always carry hand sanitizer with you? You know where I’m going with this, right? They don’t have much power and this might be the only way to communicate to the government (right or wrong) that ignores them. I plead ignorance about French politics, so I have no idea what, if anything these people ought to do, or if, in fact, there is anything to be done. I agree that mobs setting stuff on fire is unlikely to lead to meaningful reform, for any given definition of that term. Maybe it leads to a weenie roast, but that’s about it. The only thing that struck me was that if it was migrants setting stuff on fire, it probably wouldn’t make the news, because I hear it doesn’t. Anyhoo, maybe we could start a betting pool on when the peasant’s revolt begins in Britain. I hear they’re overdue for one. Demonstrations have a bad habit of getting out of hand in a hurry, Kent State comes to mind. A bad scene for sure. I watched one vehicle get torched by what looked like a percussion grenade fired from the Police side. The yellow vests had rocks and fireworks. Let’s hope they work things out this week. 300,000 walked peacefully two Saturday’s ago, this last one had 75,000. (according to most estimates I’ve read). That’s an important point! What comes after the violence often determines the result: does the general public side with the “forces of order” or the “forces of reform”? That is, how they conceptualize the two sides, and the violence between them. I’m hoping the forces of reform. There are some ugly scenes on the twitter feed that I mentioned and on YouTube. Three dead, over two-hundred injured, more than four-hundred arrested as of yesterdays figures. It should be an interesting week, hopefully productive. We can hope. But I’ll bet as indicated in this post. I have not even a guess as to the course of the French posts, or their potential to spread in Europe. Photos and short videos are unreliable guides to the intensity and scale of riots. They can make a small event look like the Fall of Rome. And now for the rest of the story. The Lime Rebellion; the end of macaroni and cheese. “INSIDE the Paris riot with embedded Rebel reporters” at Rebel Media. I don’t understand. To what are you referring? There has been no news about the riots in Australia, or none that I have seen. Now it is 4/12 and little has changed, no News on the TV about the riots (in Australia), a short 2 mins about thugs, at 6.15 am on my clock radio beside the bed, nothing in the day, so far as I have the radio on while I work from home on my computer, I read your articles in my break. It has been buried by the MSM over here too. Bush’s death may be one reason. I use the BBC, The Times, and The Telegraph. all have had extensive and excellent coverage of the Yellow Vest protests. Macron’s first step would be to reverse course on his carbon tax, that’s what lit the fuse. Many other problems with the taxes and broken campaign promises. His tax break to the upper class never boosted the economy and a approval rating at 25% even before this started. One French lady interviewed said there is no more middle class, just working class and elites. The yellow vests are organizing on social media and like you said, no real leader. That seems almost certain to happen, imo. Of course, they might try again next year. Or the year after. France’s leaders can play the long game. That is a core policy. A rollback of that would be a major accomplishment. Less so would be a promise of a policy review, a future partial change, or whatever. France’s leaders are smarter than George Bush Jr. They don’t post a “mission accomplished” banner to mark their victories. RT had the best coverage. Bush Jr. should never have gone into Iraq. I will go to my grave with Vietnam syndrome. The riot referenced above were the ones in early July 2018. No news about the Paris or Belgium riots in Australia as of 4/12/18 at least not on television. No reference made to UK coverage of these riots. Keep up the good work it provokes thought, only what we do, I have no idea. I think your point about the weak inherent potential about this protest is appropriate. I wonder if the adulation of the ‘leaderless’ nature of the protests is born out of elite fear of middle class participation and appropriation or middle class fantasy thinking about not needing to do the hard work of governing. Probably a bit of both. I think that for those who might lead this movement, life now is too sweet and the odds of personal improvement seem so low. “/Ourguys/ Burning Federal Buildings and Degenerate Art Museums In France” in the Daily Stormer. It’s the Daily Stormer. If they say it is raining, look outside before believing them. No, that was a full blown riot I watched in real time. There is an eight hour long video of it on YouTube. (Unless it has been taken down). France protests: PM Philippe suspends fuel tax rises. Sorry for the confusion, Mr Kummer, but it is my reference to President Emmanuel Macron and his cronies. France has been on secular economic decline for three decades, lead of course, by Socshevik forces. Congs, for making it to wattsupwiththat.com, the premier anti-AGW website. (1) Thank you for explaining the reference to Macron! Watts has reposted scores of my posts since 2014. Many of those disagree with core beliefs of his audience. That is extraordinary in the climate wars, where both sides tend to acknowledge only tribal truths – and see those that disagree with them as deluded or evil (or both). That makes Watts, imo, a prince. More like him and we would not be in this policy gridlock. That is not correct. While economic growth cannot be captured by one number, look at the broadest metric: real GDP. It has risen 73% in France since 1987. Due to its faster population growth, the US has grown faster (+123%). But people don’t care about aggregate GDP; we car about per capita GDP. France’s has grown faster than America’s since 1960 (the full range on FRED). Since 1987, France’s has risen 44% (thru Q1 2017). France and Europe were slow to recover from the Great Recession. But it has recovered and resumed growth. Since its start in 2007, France’s per capita real GDP has risen 6% (thru Q1 2017). calamity, with few options in the Socshevik model. people still work a full day. Sorry, facts are facts. You are wrong. Peak growth doesn’t matter. Only the average rate over time matters. It is not really a problem of economic growth, but a problem of revenue. For 10 to 15 years the revenue of middle and lower classes has not really risen (well it followed the inflation). For the upper classes it has. The consequence is in this trivial fact : people doing their weekly shopping for weekly meals, used a 50 EUR banknote, and now they realize the bill has gone over and is more 60 EUR than 50. – the economic crisis of 2007. In France the crisis was mostly absorbed by the social security, so there was no rise in unemployment like in the US. But on the other side there was no sharp economic growth and sharp improvment of emplyment. – The 35 hours. As you may know the legal duration of work per week in France is 35 hours, since 2002. Part of the deal to pass this law was a stop in salary growth. 15 years later, we are still paying for that. Consequently, people are under the impression that their purchasing power is going down (it is false by the way). And they had that impression for years. Sarkozy was elected in 2007 upon the very promise to “go seek the puchasing power with its teeth”. To that you have to add the financial situtation of the French State : debt and deficit, thus an they either have to generate economic growth, raise the taxes or diminish the public spending. For years the different government tried to go for the first option, and a little for the second (but there is so much fiscal exemption that it was negated). Because in France, saying you will diminish public spending is equivalent to say that you will kill children. Thus the government cannot do much to quell the protest. If Macron announce an augnmentation of the minimum salary, he will be destroying the economic policy he tried to enact (to make the French company more competitive). If he announce election, he suicides himself politically. As for the question of the ISF, the famous tax break for upper classes. A few things about it : it was a non-profitable tax. More costly to collect than what it provided. Second, since it reformation upper class people stopped, or at least a great deal of them, to do fiscal breakout (i. e. to live in France but to be paid in Luxembourg). In a country were only 50% of the population pay the tax upon the revenue (direct tax) it is not insignificant. But it was a disaster in term of citizen apporval. This tax was created under the pretense of social justice. For a time there was the idea of raison it to 75% for all revenue beyond one million EUR. To reform this tax was politically dangerous. About the comparison of economical growth between the US and France, remember that the French social security lessen greatly the effect of both economical recession and boom. On the short term it make the US better, but in fact on longer term the total of variation is the same : the US made some +4 and -3 in growth, France do +1,5 and -0.5. result is the same but less impressive. Yes, that’s exactly what I said. Both France and the US have had periods of superior growth, but over time their real per capita growth has been similar. But that might be changing. I’m skeptical of claims that people don’t know what is happening in their lives. There is a third explanation, and much more powerful. France’s increased productivity growth has not been shared with its people. Now they’re told that they must get even less. They believe, rationally, that this is unfair. They can’t state this clearly, and the media have no interest in doing so (much better to, as always, blame “agitators and bandits”). Please read an Econ 101 textbook. I know that people in comments are immune to facts or logic, but even so this idée fixe of yours is silly. The richest East Asian nation (per capita GDP) is South Korea. France is 1/3 richer. Rich nations grow more slowly than less rich nations. For obvious reasons. You are correctoe, Mr Kummer and that is what I cited. hear in the USA, under the previous administration. “Please read an Econ 101 textbook.” I read as many as time permits. or it will die a slow death. Your comment is total gibberish. Good-bye.